RH panel of Wilton Diptych. The Wilton Diptych (c.1395-99) is a small diptych consisting of two hinged panel paintings, painted in the style of International Gothic art - the courtly idiom of the late 14th century. This rare example of medieval painting appears to have been created for King Richard II of England (lived 1367-1400; reigned 1377-99), since he is shown as the donor, and takes its name from Wilton House, the stately home of the Earls of Pembroke who owned the diptych for two centuries. When opened, the right-hand panel shows the Virgin and Child surrounded by eleven angels set in a meadow studded with flowers, while the scene in the left-hand panel shows a kneeling Richard II in profile, facing the Virgin. His cloak is decorated with his personal emblem of white harts, along with sprigs of rosemary, the emblem of his wife, Anne of Bohemia. Around his neck is a gold collar decorated with Cytisus scoparius, a common shrub (known as planta genista in Latin), from which Richard's Plantagenet dynasty derives its name. Behind Richard stands his patron, St John the Baptist, who is presenting him to the Virgin, and the English royal saints Edward the Confessor and Edmund the Martyr. Each sponsor holds their identifying attribute: John the Baptist holds his symbol, the Lamb of God; Edward the Confessor holds the ring he gave to John the Evangelist; Edmund the Martyr holds the arrow which caused his death in 869. In response, the Christ Child in the right-hand panel is raising his hand in blessing. When the diptych is closed, one side contains Richard's royal coat-of-arms, while the other depicts Richard's emblem - a white hart, with a small golden crown around its throat, sitting on a grassy meadow under a gold sky. Measuring about 12 x 18 inches (37 x 53 cm) when open, the work is done in egg tempera, applied in thin glazes. The background - as well as other details - is enhanced with gold leaf. The artist's Renaissance colour palette included the use of expensive colour pigments, such as lapis lazuli for the blue garments seen in the right-hand Virgin and Child panel. Richard II's robe is coloured with vermilion, another costly pigment. Unfortunately, some of the colours have faded; the roses in the angels' hair, for instance, were originally painted a much richer pink, while the green grass of the exterior hart panel has darkened considerably. The style of painting adopted is characterized by extremely fine filigree portrayals of delicate small-scale figures, with refined facial features, wearing robes that fall in soft folds. The Wilton Diptych is not dated and there is no written record of when it was painted. Scholars therefore continue to debate the issue, and various theories have been presented. The current consensus is that it was created during the last five years of his reign. 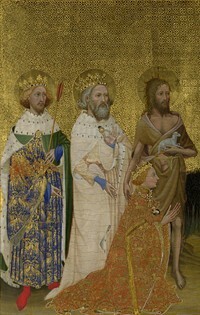 The date of the Wilton Diptych, as well as Richard's identity, is corroborated by the penant held by an angel who stands between the King and the Christ Child. It bears the Cross of St. George, the emblem of England, is topped by an orb upon which sits a tiny map of England - or Ireland, where Richard happened to be campaigning in 1394-5. If the Wilton Diptych was painted between 1395 and 1399, it is clear that Richard did not have long to live. Furthermore, the inclusion of 'eleven' angels (traditionally a fateful number) may conceivably hint at impending disaster. However, the meaning of the 'eleven angels' is believed to be based on the second dream of young Joseph (Genesis 37:9), in which the sun, the moon and eleven stars bowing down to him are completed by Joseph himself, who becomes a twelfth star (making a fortuitous total). 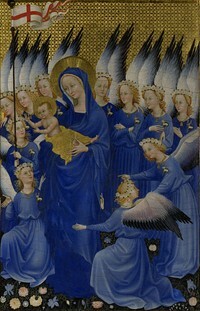 The parallel set-up in the Wilton Diptych consists of Jesus, the Virgin, eleven angels plus King Richard, making twelve angels - a sign of good fortune. As stated above, the painter of the diptych - sometimes called the "Wilton Master" - has never been identified. Indeed, no other religious paintings similar in style to that of the Wilton Master have been found, making it extremely difficult to pin down candidates. The closest resemblances to his style come from certain International Gothic illuminations produced on the Continent, from the early 15th century. Unfortunately, the artist(s) responsible for these illuminated manuscripts is also unidentified. Given the exceptional quality of the diptych, the most likely candidate is a Netherlandish artist of the stature of Jacquemart de Hesdin (c.1355-1414); or one of the Limbourg Brothers (Herman, Jean, Pol - all of whom died of plague in 1416), who are best-known for Les Tres Riches Heures du Duc de Berry (1416, Musee Conde Chantilly), an absolute masterpiece of miniature painting. An outside possibility is that he was a Bohemian artist, brought to England by King Richard's first wife, Anne of Bohemia.  Avignon Pieta (c.1454-6) Louvre, Paris.  Hours of Jeanne d'Evreux (1324-28) Cloisters, Metropolitan Museum.  For the interpretation of other International Gothic paintings, see: Homepage.